Even if summer is months away, it’s time to start thinking about how to take your backyard barbeques up a notch this year. 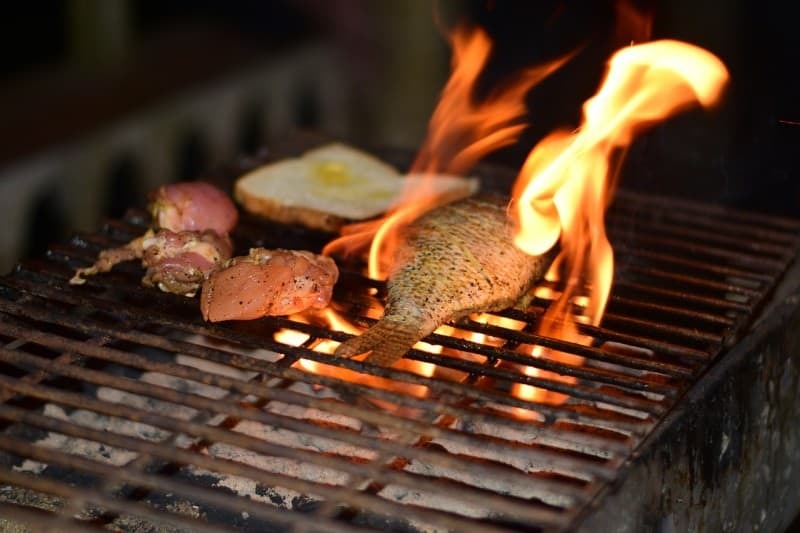 Whether you’re grilling traditional favorites or want to experiment with smoking your own, consider using your barbeque grill to try out some new recipes next summer. Why Is a Charcoal Grill the Way to Go? A charcoal grill offers many benefits, including providing your food with an excellent smoky flavor. Charcoal grills are much less expensive than gas or electric grills, and require minimal maintenance. They are easy to move, providing maximum portability, and come in a variety of sizes. With a range of designs and options, a charcoal barbeque grill can accommodate any of your cooking needs. Charcoal grills are portable, meaning it’s easy to move them from place to place. If you have a small car and want to bring your grill on a camping trip, never fear! It should fit just fine. It’s also easy to assemble, featuring just a base, a crank, a lid, a grate, and three legs. It takes no more than thirty minutes to put together, allowing you to move it and use it whenever and wherever you’d like. Another benefit of a charcoal grill, as compared to a gas grill, is that it requires no fuel or outlets. All you need is a bag of charcoal, which can be purchased at minimal expense. Most charcoal grills are incredibly affordable, starting at just $25 in many cases. A gas grill can cost up to $1,500, making it difficult to afford. Therefore, price is rarely a factor when you’re figuring out which charcoal grill to purchase. Charcoal grills work by burning lump charcoal or briquettes. Lump charcoal, produced from scrap lumber, produces minimal ash, and burns hotter than briquettes. Briquettes, on the other hand, are made from sawdust and infused with lighter fluids. Charcoal tends to last for quite some time, and is less expensive than propane. The first thing you need to consider when purchasing your charcoal grill is what size you would prefer. If you have a small family, or do not need much room to cook, consider purchasing a smaller grill. Measure the area that you intend to grill in to make sure it will fit. If you plan on entertaining large groups of people, or simply want to cook larger cuts of meat more effectively, purchase a larger charcoal grill. Some grills also come with special features, such as neat accessories that make it easier to grill delicious meals for your family. You can purchase a charcoal grill with shelves, which will allow you to hold utensils, plates of food, or marinades, or go without for a more simplistic appearance. Many charcoal grills also come with built-in thermostats so that you don’t need to open the lid of your grill to check the temperature. Did you know that you can even purchase a grilling basket or sheet? These handy details allow you to cook smaller foods, like small vegetables or seafood, without having to worry about them falling into the coals. That being said, if you’re new to charcoal grilling, you should probably stick to a simpler grill with fewer bells and whistles so that you don’t have to worry about all of these details while you’re getting the hand of charcoal cooking. When purchasing your charcoal grill, you should also set aside a little extra money to purchase a grill cover. 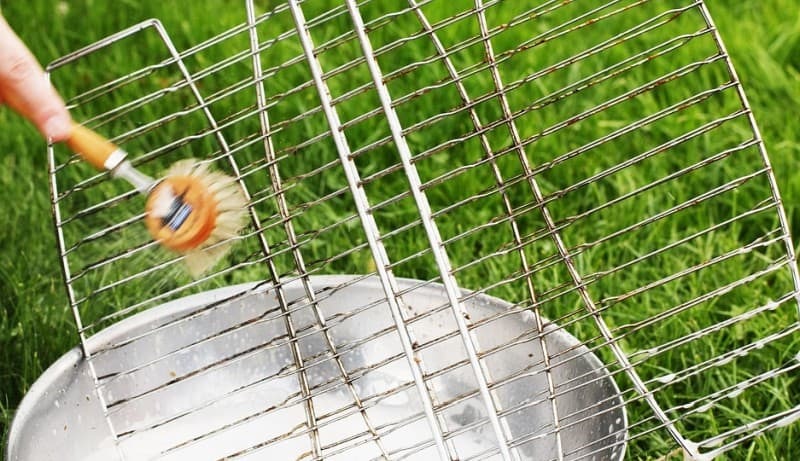 This is a worthwhile investment, as it will protect your grill from the elements and also keep out rodents and insects who like to make their nests inside unused grills. Opt for a cover made out of vinyl, oil cloth, polyester, or nylon for best results. Pick a location for your charcoal grill, ideally one that is at least ten feet from your house or any other permanent structure. Try to keep your grill out of contact with low-lying limbs or other elements that could potentially catch on fire. Make sure the grill is resting level on the ground before beginning. If you are planning on using wood chips instead of charcoal, or if you are smoking with your charcoal grill, soak the chips in water for at least half an hour. This will allow them to molder and smoke instead of flame up instantly. Dump your charcoal on one side of the charcoal grate. If you are using a charcoal basket, tap the edge with tongs every hour or so to knock ashes through the basket holes. Drain your wood chips and lay them on top of the coals. After the first hour of cooking, replace the charcoal and wood chips. If you are planning on grilling normally with your charcoal grill (and not smoking), you can skip the previous steps. Instead, you will simply pour your charcoal into the grill and start the fire. Using a chimney is one of the most popular ways to do so. A chimney is a tube with an upper and lower compartment. To use it, simply put newspaper or another form of kindling in the lower compartment and charcoal in the upper. Light the paper, and within fifteen minutes you will have a measured portion of charcoal ready go. 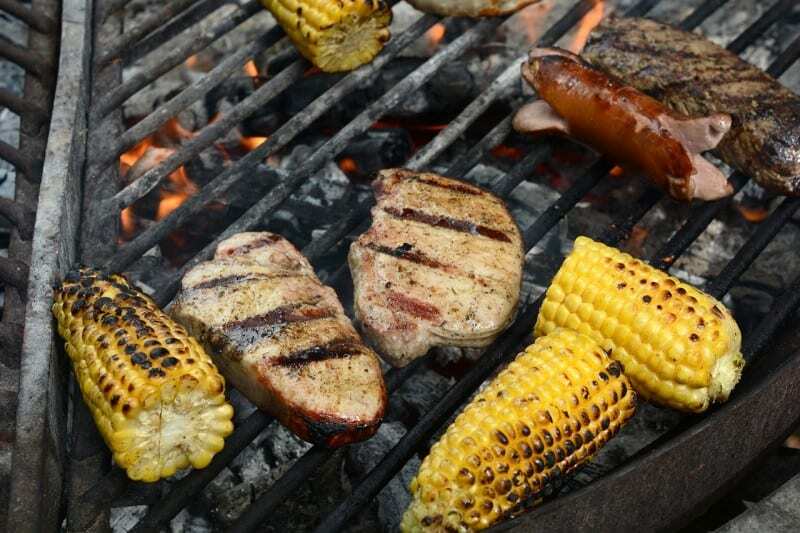 Bank your coals on two sides of the grill, putting a pan of water in the center beneath the food. This method, called two-zone cooking, helps create tender, tasty meats and savory grilled vegetables. Once you’ve preheated your grill and prepped your food, you’re ready to go. Charcoal grills cook your meat slowly and over an extended period of time, allowing the meat to remain tender and moist. The slow exposure to heat separates fat from the meat, including fewer overall calories in your food than if you had cooked it on a gas grill. Critical nutrients are still retained, and the food is properly cooked, even on the inside. You do have to be aware of the fact that charcoal grills can be challenging to light and require some practice to get used to. They take a while to heat up, meaning it can take a bit longer for your food to cook. The fires produced by the charcoal can occasionally flare up, burning your food and potentially causing injury if you are not careful. Since you cannot reduce the temperature all at once, you need to make sure you are monitoring your charcoal grill as it heats and cooks. This will help eliminate cooking mishaps as well as potential safety hazards. If you’re looking for a unique twist on your regular weeknight dinners, consider smoking on your charcoal grill as an alternative to regular grilling. It’s easy to smoke on a charcoal grill, particularly if you are already familiar with cooking on one of these handy grills. To start, fill a chimney starter so that it is about a third full of briquettes. Once they are lit, pour all of your charcoal onto one side of the cooking grate. You can also use a charcoal basket, which keeps the coals more closely together. Then, place a large foil pan on one side of the grill. Add two cups of water to the pan. This water will help maintain a low cooking temperature and adds moisture to the food. 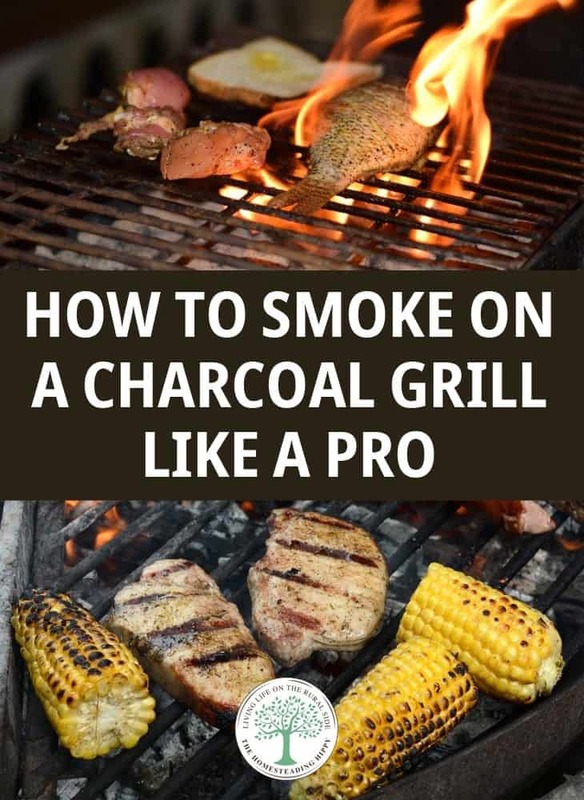 If you’re smoking with a charcoal grill, you have to be careful about the food drying out since it will be cooking for much longer than normal. The water in the pan will help add moisture and make it less likely that your food will dry out. Let the coals burn for about thirty minutes to an hour, allowing them to burn down to the correct temperature. This will also allow the water plenty of time to heat up. Put some damp wood chips directly onto the coals to smoke, and then place your food on top of the cooking grate. Cover the grill, and be sure to add more coals to maintain the heat about once an hour or so. That’s all there is to it! Smoking with a charcoal grill is a great way to create tasty meals like ribs, brisket, and roasts. If you’re looking to take your charcoal grilling game up a notch, this is definitely the way to go. Here’s a list of the best charcoal grills for smoking purposes. Charcoal grills are relatively low maintenance, and much less so than gas grills. You don’t have to worry about multiple parts, as the only part that is likely to wear down is the grate. This should be replaced every few years, but this depends on the type of grill you have and the quality of the material, as well as how often it is cleaned. Most charcoal grill problems are easily resolved. If your food becomes too smokey or dry, the problem is likely too much smoke. Try grilling thicker cuts of meat, as they will hold their juices better and will, in effect, self-marinate. Another problem is when food sticks to the grill. To combat this, always keep your grill clean, scraping it down before each use. You may also find that your food chars on the outside before it has cooked all the way through. To fix this problem, move all of your charcoal to one end of the grill or turn one end of your grill to the hot zone and the other to a low zone to build a multi-zone grilling area. This will allow you to sear your food over the hot zone before you move it to the warm zone where it can finish cooking all the way through. Finally, if you’re having trouble keeping track of the temperature of your food when it’s roasting or cooking, consider inserting a grill thermometer through the lid vent of your grill. Rotate the lid if you want to check the temperature of various heat zones, making sure the stem of the thermometer doesn’t touch the actual food. Over time, your charcoal grill will build up ash and rust. If you clean your grill after every use – or at least once or twice per grilling season – you will be able to use your grill for a longer period of time and also help make the grilling process safer and more enjoyable. Plus, your food will taste much better! To clean your grill, first select a safe area in which to get set up. Do this off to the side of yard, and not on your deck or any walking paths. You will be brushing ash and debris off your grill, so this will help eliminate any unnecessary mess. First, brush all dirt and debris from the grill. You don’t have to wear gloves, but keep in mind that your hands will get dirty if you don’t. Lift the grate out of the grill and use a bit of force as you are brushing. Try not to use too much force, because you could chip the finish on your grill. This can impact cooking and flavor over time. You will also need to remove any buildup from the grill lid and the bottom of the grill. Use the brush to clear out any encrusted bits and wipe everything down with warm, soapy water. You will also want to remove any leftover ashes from the bottom of the grill. Ashes can build up over time, and affect the flavor of your food. Get rid of them when they start to accumulate. Once you’re done cleaning your grill, you can reassemble it. Make sure all of the pieces are back in place and then heat up your grill so that you can oil it. Oiling the grill grate will help prevent food from adhering to it, making cooking and future cleanup much easier later on. Only a charcoal grill can give you the smoky, crispy flavors you’ve been longing for. Hitting temperatures of six hundred degrees or more, a charcoal grill has cooking abilities that far surpass that of a gas grill. If you’re interested in smoking your food on a charcoal grill, consider our tips for the tastiest food this summer.